OK, so who’s going to tell them? We are sorry for that previous post. Those responsible have been sacked. Was that the same one? This was on UK Twitter, I guess it took time to float over. Oops! Still my favorite new euphemism. Also, I think they mean consequence-free sexytimes, as in no babbies. Julie Brown did a thing called "Earth Girls are Easy" some time ago. Worth finding, in my opinion. I'd like to think Karen is training for this mission right now. She must be doing something, I haven't seen hide nor hair of her here. Maybe if we start posting more anime? 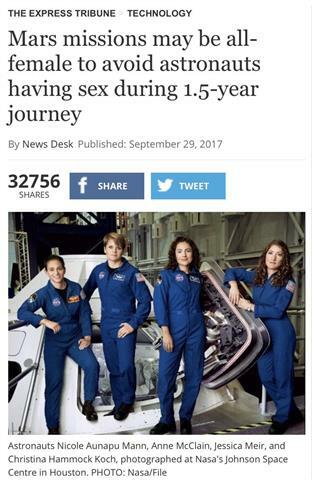 "That's one small step for man, one long love-in for women"?